The beginnings of Ashbourne Church Choir can be traced back to 1978. In 1979 the visit of Pope John Paul II to Ireland provided the impetus for the firm establishment of the choir to sing at a special Mass to welcome the Pope in Drogheda that year. The choir was thus founded by Liam Hanley and has been providing music ministry at the 11.15 Sunday Mass in Ashbourne Church ever since. Ephrem and Giovanna Feeley succeeded Liam as directors of Ashbourne Church Choir in 2002. Central to their work is an understanding of the choir’s role in leading the congregation’s weekly prayer and praise. While building on the rich corpus of motets and sacred choral works in the choir’s repertoire, they have introduced a wealth of traditional hymnody and new, contemporary church music by Irish and international composers. Celebrating the Sunday liturgy is the primary focus of the choir, culminating in the great feasts and seasons of the Church year. However, time is always found for days out, social events and new experiences. The choir has developed ‘links’ with a number of choirs around the country and members always enjoy the opportunity to meet with other people and sing with their communities. In 2005 the choir undertook a very successful pilgrimage to Rome, where they welcomed the newly-elected Pope Benedict by singing at a papal audience in the Vatican City. As it approaches its anniversary celebrations in 2009, the choir hopes to embark on another trip abroad in addition to a number of exciting ventures, including links with new choirs and parishes, a series of musical events in the community, commissioning a new liturgical music piece, and maybe even recording its own CD! The choir’s membership consists of thirty singers, male and female, with ages ranging from the teens to the sixties. The choir meets to rehearse on Monday evenings at 8pm in the parish offices. We are always open to new members and no previous vocal or musical training is necessary – all are welcome. Giovanna Feeley holds a First Class Honours Master’s Degree in Sacred Music from the Pontifical University of Maynooth, specializing in chant performance, direction and liturgical composition. She has studied voice with Jody Beggan at the DIT Conservatory of Music and Irene Sandford at the RIAM. She works in liturgy, music and pastoral theology in St. Patrick’s College, Maynooth and with diocesan agencies. Ephrem Feeley studied organ with Andrew Synnott and Una Russell at the DIT Conservatory of Music. His liturgical music has been published and recorded in Ireland, the UK and the USA. He has written several piano and organ pieces, some chamber works, and several songs and song cycles. He teaches Music, Choir and Religion in St. Joseph’s Secondary School, Navan. For more information on the Ashbourne Church Choir, please visit their website. The Folk Group as we know it today was formed in the year 2000. Fr Jim Lynch was keen to set up a choir which would compliment the already formed senior choir, in an effort to reach out to the youth of the parish and encourage attendance at mass on Sundays. The founder members had many years experience with Folk Groups, as they were called, throughout the country since their introduction into the liturgy back in the early seventies. The style of music performed by the Ashbourne Folk Group has evolved since it’s beginnings ranging from simple folk to rock gospel. The group rehearses every Tuesday from 0830 to 0930 in preparation for the following 12.30 Sunday mass. The Folk Group “season” is aligned to the school year, starting in September and winding down in early June. We welcome new members who can sing and/or play a musical instrument. If you are interested in joining, contact the Musical Director, Elaine Kavanagh or leave a text with your contact details. While age is not a barrier, ideally you should be in your teens or over. Hide information on Folk Group. The original Ashbourne Youth Choir was formed in June 1984. The founder Margaret McCabe was approached by local school girls wishing to start up a choir. They met on a regular basis to practice and take part in the weekend liturgy. The choir celebrate 25 years of continuous service to the parish in June 2009. Over the years, the Ashbourne Youth Choir have participated in television and radio masses, competitions and numerous parish functions. 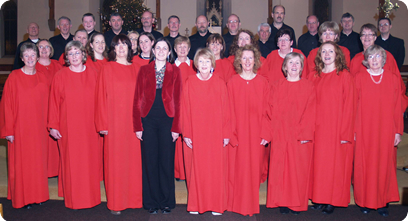 In January 1995 Eimear Keogh took over the leadership of the choir. With the support of choir members and their families, the Ashbourne Youth Choir have taken part in a number of the annual Halleluiah Concerts in the Point and RDS. In 2018, Giovanna Feeley established a new Youth Choir – Young Ashbourne Singers. It offered young people an opportunity to receive a musical and choral education, quality instruction in singing and vocal technique, while exploring fantastic new music, making friends and having FUN! The Young Ashbourne Singers meet in the Parish Hall every Monday 4.30-5.45pm. All interested young singers should contact youngashbournesingers@gmail.com.